The 28-can mini fridge features a self-locking door handle and removable shelves. When the sweltering summer heat sets in, most enjoy cooling off with a nice, cold drink. Typical ice chests keep drinks cold for mere hours, leaving us with a bunch of cans floating in water. 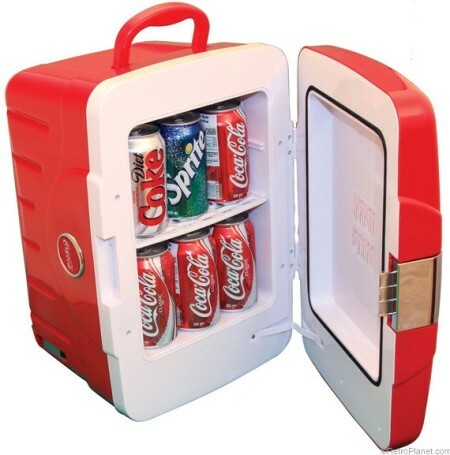 A new line of Coca-Cola coolers and mini fridges were designed for tight spaces and travel. With seven different models, you can beat the heat – or party it up – in pure retro style. Using thermoelectric refrigeration – a scientific method that use the Peltier effect to draw heat away from the contents of the fridge or cooler – these units use less electricity and zero toxins. Travel fridges use just 4.5 amps – less than typical car headlights. With units that accommodate six to twenty 12-ounce cans, there’s a fridge or cooler for anyone, including campers, boaters and the college-bound teenager. Plus, Coca-Cola collectors will love the vintage-inspired style of these modern-powered appliances. This cooler/fridge combo can be used sideways or upright, and can also be used to keep hot food at a toasty 149 degrees. From a glass-front mini-fridge to a cube fridge that fits perfectly in the back seat of the car, these easy-to-move units are great for the office, home, back porch, man cave and dorm room. Hosting a backyard barbecue? Just stock your fridge or cooler with cans or bottles and guests will appreciate not having to go elbow deep in a cooler full of melting ice. Speaking of ice… the fridges will preserve cubes significantly longer than a standard cooler. Select units also double as warming station, keeping pre-heated food or drink hot (up to 149 degrees). That means keeping the grilled food warm is simpler than using chafing dishes. Plus, double-duty makes the units attractive for year-round use, especially in the garage or dorm. 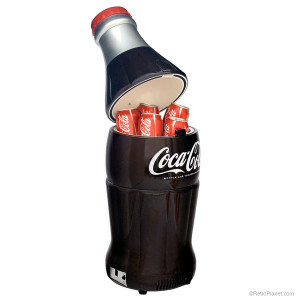 Of course, there’s also the novelty of the collection… two of the units are replicas of a Coca-Cola can and bottle. 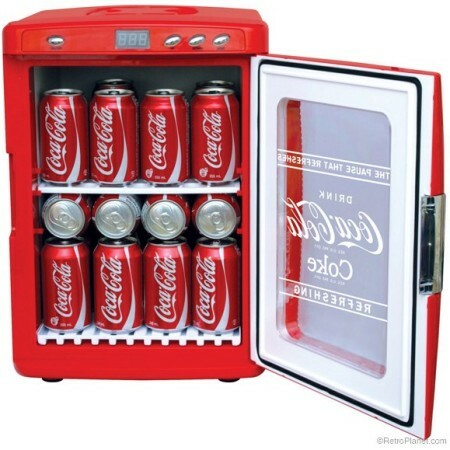 The Coca-Cola Soda Can Fridge holds eight 12-oz cans (or two 2-liter bottles), and measures 17.75″ high by 11″ deep. This unit also doubles as a food/drink warmer. 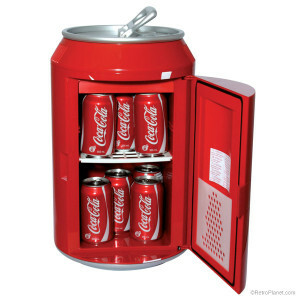 The Coke Bottle Mini Fridge holds 15 12-oz cans and measures 10″ wide by 28.25″ high. So whether you need to beat the heat on the back patio, or want to hit college in full, retro style, these fridges and combos are sure to keep people talking, while keeping your favorite beverages cold (and food nice and toasty).